As cities across the country jump on the Complete Streets bandwagon (it's public transportation, after all), they're on the hunt for good examples of Complete Streets documents: why reinvent the wheel, when it's hard enough trying to reinvent the street? 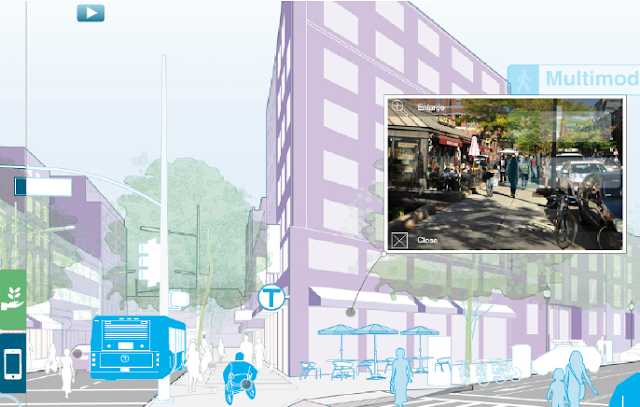 One lovely model that any city would do well to emulate is Boston's Complete Streets website. And then of course there are the Complete Streets Guidelines themselves. There's a lot to wade through, but like the website the guidelines incorporate graphics and layouts that make them easy for transportation neophytes to use and understand. 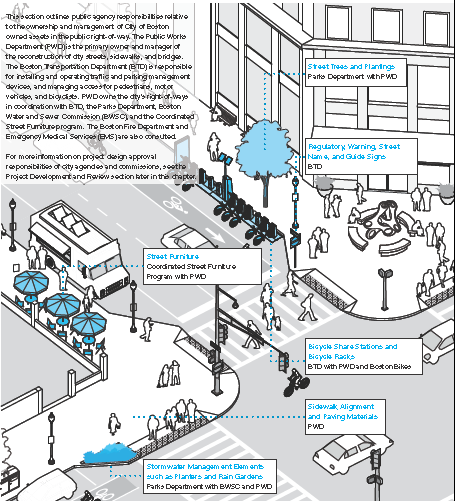 I especially liked graphics such as this one in the Implementation section that showed who was responsible for each streetscape element in the City. It's easy for even the most dedicated advocate to get discouraged when navigating a bureaucracy as big as Boston's, so this type of information is crucial to help the public remain engaged. With limited city budgets, it's easy to find reasons to skimp on design budgets in order to focus on policy development--but planners who want to create effective and lasting Complete Streets also have to prioritize the "look" of documents and websites, or users won't bother to read all those awesome policies (e.g. 10-foot lane widths, way to go Boston! ).